Yup. 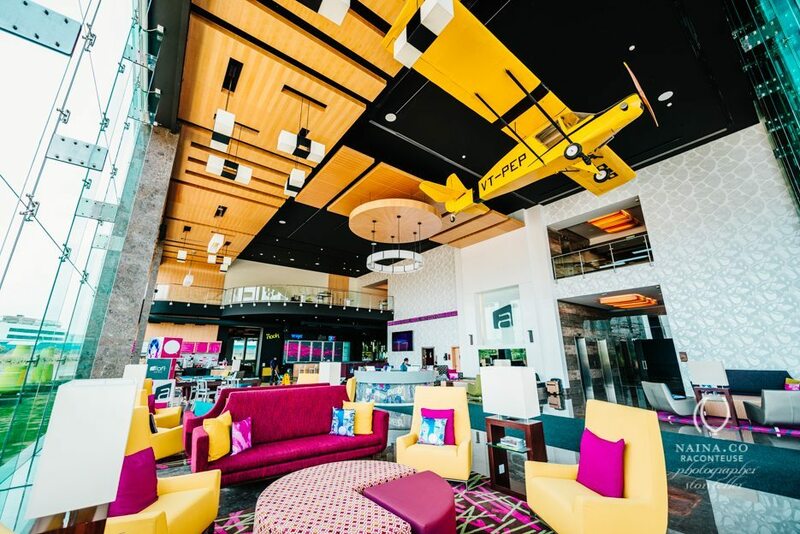 That’s a Cessna ( without it’s engine ) hanging from the ceiling of the newly launched Aloft Hotel at Cessna Business Park, Bengaluru. Fitting. It’s a delightful hotel and I had a chance to visit and photograph it’s launch. It is a Starwood Managed property and like all other such hotels, the attention to detail is fantastic. I’m going to leave you to scroll through the photographs and drop in some lines about each image as we go. The lobby is the highlight of this hotel. It is welcoming, airy, bright, colorful and as you enter, you can immediately see what the hotel has to offer. The WXYZ bar, re:fuel ( the corner where you can pick up refreshments on the go ), Nook ( the restaurant ), a Pool table and such a nice staff. The hotel also has love music and other performances twice a week. It’s a place to relax and have fun if you’re visiting. As popularity of this hotel grows alongwith the number of offices in Cessna Business Park, I can see this lobby becoming a regular hangout for many. The music playlist is curated by an international DJ and about 600 songs play on loop each quarter. Like the music, other details like the cushion covers and other graphics in and around the lobby are changed and revamped each quarter. Keeps it looking fresh and if you’re a traveler, the likelihood of you finding a completely fresh look the next time you’re at the hotel, is very high. Below, the lift lobby at left and the gym on the right. Good balance of Yoga practice area, weight training and a couple of universal strength training machines alongwith treadmills and a stepper. The gym faces the swimming pool. It’s a 4 feet deep splash pool and at least in the month of June, I found the water chilled even at peak afternoon! It’s windy probably because it’s Bangalore and also because of existing vast open spaces at the business park. The Cisco building is right next to the hotel. There’s a live ticker that shows scrolling keywords and interesting tidbits of information. 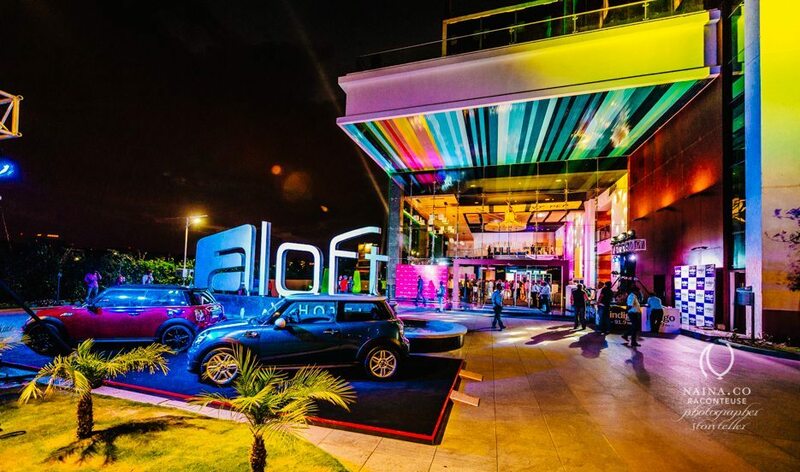 There is also a set of television screens that have been put together to create a live feed of content that is produced by the Aloft social media channels. You can find them on Twitter as @AloftCessnaPark and on Facebook as Aloft Bengaluru CBP. I also got a quick tour of the Presidential Suite. Some photographs of the standard rooms below. I stayed in one of these rooms during my stint there. Simple. Functional. Cosy with a touch of color and quirky design. Oh and did I mention the 20 Mbps WiFi? Free. Yeah. That. Another brilliant thing they’ve done is shampoo and soap dispensers in the shower. Instead of the small plastic bottles that all other hotels carry – and hence pile on the plastic waste – Aloft completely does away with that waste and instead had dispensers. Sure you can’t take them away with you – I do like taking those with me especially if it’s a great brand – but considering how much it helps with the environment, who cares if I can’t take it away anymore. The Starwood team had planned many activities for the media including things like a Scavenger Hunt and all these activities had prizes at the end of it as well. There was a short presentation by some of the Starwood team members. Above, Ashley Chapman who handles PR. She is on Instagram as @achapmanpr. Below left Anjali Mehra, Assistant Director Marketing & Communications South Asia at Starwood Asia Pacific Hotels & Resorts Pte Ltd and on the right Brian McGuinness who is the Senior Vice President, Specialty Select Brands. The next day started with a bang! The Starwood team had arranged for a Zumba Dace session early in the morning and it was a blast! This was followed by a short tour of the Four Points by Sheraton property at Whitefield in Bangalore. I’ve shared photographs from that tour in a separate blog story here. Below Dilip Puri, MD India and Regional VP South Asia of Starwood telling us more about Starwood’s India plans at the Best Brew pub at Four Points. The evening was the most-anticipated as the official launch party for Aloft Cessna Business Park was finally happening! The hotel was lit up and looked beautiful, funky and very colorful against the night sky. Guests started arriving right on time and slowly the who’s who of Bangalore were experiencing Starwood hospitality. There were a number of events planned for the evening and one after the other there was something of everyone. This paint / art installation below was my favorite. A simple enough concept. Some guests were asked to pour paint over this structure to help create a unique piece of art to commemorate the official launch party. That turquoise paint was poured by me! Yay! Street-dance performers “The Beat Boys” rocked the evening as well. Some guests danced, most didn’t. And some danced a LOT! Like me! One Nite Stand performed live. This group “Different Strokes”, are water percussionists and they performed one absolutely fantastic set for the guests. This artist handled her crystal ball like it didn’t exist i.e. effortlessly. It seems like it’s nothing and effortless but I can imagine even balancing the crystal ball on my palm without then dropping it to the floor and shattering it! This is called “Contact Juggling” and the lady’s name is Ami B. Shroff. It was quite a view with guests milling about engaged with some activity or another. Dinner was served and soon the party moved poolside where there was a DJ and bubble-dancers! Bubble Dancers in the swimming pool. Now that’s how a launch party is done! It was spectacular, psychedelic and exhausting. I still can’t believe the colors! The energy was infectious and only Bangalore’s ridiculous 2330 hours closing time forced guests from the dance floor. I can’t recommend this hotel enough especially if you’re going to be in the vicinity. It’s a no-brainer. The menu is tad limited ( the buffet is endless though! ) but whatever’s on it is done well. Especially do try the Cessna Chicken Burger. Some of the others things that I liked from the menu was the Cinnamon French Toast for breakfast, the Tomato Soup ( sour and tangy exactly how I like it ), the Salmon Salad with capers was simple and yummy too. And the Warm Brownie Pudding – it’s in the kids menu but that shouldn’t stop you! So yes, tad limited menu but pretty much everything on it is great. I took all the tea sachets with me from this box below! LOVED them flavors! This below is the delicious Cinnamon French toast with whipped cream and berry compote. Of course, this below was the cherry on the cake. I found this in my room when I checked in. And they had done their research – I’m a Nikon user! And the cake was delicious to boot. Don’t think I’m going to get over this one as a “delight topper” anytime soon. Thank you. Thank you Aloft for a great time! News is that Starwood is also planning the launch of two of its luxury brands W and St. Regis in India. Stay tuned! Hey Sumukhee! Thank you for your kind words! I’m not a Nikon girl by choice, it was default – was getting a great price so went for a Nikon. I use FujiFilm a lot too! I’m not too great with the writing – my strength is in the visuals but I do appreciate that you think my lines are any good! Cheers! Met you at Adobe Symposium 2014. Amazing work done by you. I like all the pics and great job!! !.